They had originally asked me to speak at his funeral. I politely declined to attend, saying it would be too emotional for me. I would have liked to have been there, to be part of the shared grieving process. After all, he’d been my mentor and was such an inspiration for me. If only I’d been able to reach the heights of his success and popularity. He died on his birthday – a real Shakespearean tragedy, you might say. As a Knight of the West End theatre, I think he would have appreciated the irony. I often imagine him opening his gift. The Newton’s Cradle he’d always wanted. Like the big kid he was, he probably would have pulled on one of the metal balls straight away, closing the mercury switch that detonated the explosive device. I knew he would never read the goodbye note I attached to it, telling him how much I really hated his ‘niceness’. How behind my smile, I was just waiting for a chance to pay him back for his mystifying success. And now it was my turn for the limelight after waiting for so long. But I just wanted that note to be there with him, when he went ‘out’. Exit, stage left. The real irony is, that they managed to identify my signature from two fragments of paper. During the trial, I got the biggest headlines of my career. But what use is it to me now, stuck on the Inside. I call it rough justice. I hear they’ve done a wonderful obituary for him on BBC1. Life just isn’t fair. This story is written for Sunday Photo Fiction: August 31, 2014, hosted by Al Forbes. For more details, click the logo. To view other entries in this challenge, click on the blue frog. Excellent. A perfect bomb. 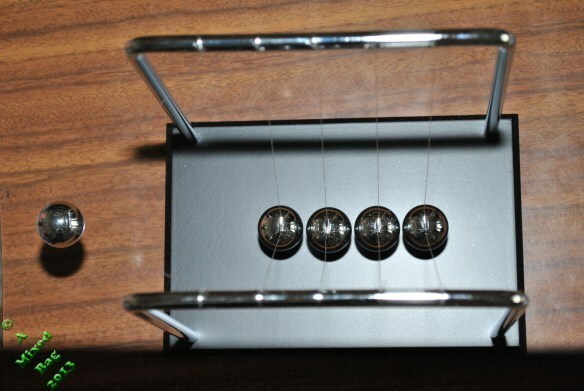 After all, who can resist a newton’s Cradle? I know when I had visitors last year, everybody played with it as soon as they came through the door. Love the signature bit as well. The green eyed monster really did get him by the short and curlies. It was a good twist on it. A great depiction of a jealous person. That’s the last time he’ll leave a letter at the murder scene, I bet. Thanks. I wanted him to pay for his actions. I thought he should be undone by his vanity! Thanks for your comment. Many of my shorter stories are in the first person. It just seems to work that way! Brilliant story. Glad he got caught. Thanks. I didn’t want him to get away with it!